I have been obsessed with cycling since my uncle took me to see my first ever, professional race in Montecatini Terme, I was 11 years old. It was the first time I had ever seen a bike race and the biggest names in cycling were there; Eddy Merckx, Gianni Motta, Franco Bitossi, Felice Gimondi to name just a few. The atmosphere from the crowd was electric especially every time Merckx came speeding past. It was a day I will never forget. From that moment, I took up cycling with a passion. I raced as a junior, and loved being part of my local cycling club, the personal challenge and the collective camaraderie was fantastic. I have made many good friends and it has given me the opportunity to participate in events in the UK, France, Italy, Israel, Jordan and Cuba. I have also organised a number of Charity cycle tours from the UK and Belgium to Disneyland Paris where I worked for 12 years, raising over £150k for the charity Macmillan Nurses. For groups of close friends, I have also organised many private cycle trips to Italy; in particular Tuscany, whose beauty in my eyes is unrivalled. My career has always been in the travel industry, I have a great deal of tour operating experience, having spent 12 years working for The Walt Disney company in a variety of senior roles plus worked for Italian and UK tour operators. I decided last year, to start my own cycling tour operation to Tuscany to capitalise on my passion for cycling, my tour operating experience and the many contacts throughout the region. Most importantly, my family and cycling friends are all based in and around the beautiful town of Montecatini Terme who all share my vision. Our aim is to offer a variety of cycling experiences whether you’re a keen sportsman wanting to challenge yourself in a cycling event or a Ciclomatori who wishes to indulge in a more sedate, lighter cycle experience and concentrate more on making friends and discovering the finest Tuscan cuisine! Or perhaps a mountain bike, training week or general cycle breaks with family or friends at whatever level of experience you feel comfortable with. Whichever package you choose, you will fall in love with the region. My sister, Michela, has many years of travel experience, working on behalf of American Express in Florence, accompanying groups in both Italy and elsewhere. She lives near Montecatini Terme and helps out on occasions during the summer season with her warm friendly nature, perfectly reflects the personality of Gusto Cycling and our determination to welcome all our guests like one of the family! Massimo Chirli has a great passion for cycling, he knows the Tuscan territory like the back of his hand, both on and off road. A professional in the tourism sector for “Gran Turismo”, his knowledge of the tourist routes in Tuscany is extensive from the Apuane Alps to the Chianti region up to Maremma to the main island of Elba. See the map for more information about these areas. 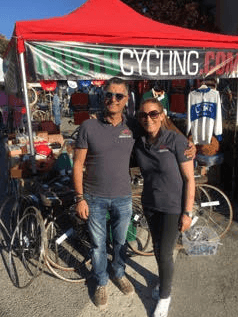 Massimo is part of the Gusto Cycling team and helps Marco each year during L’eroica vintage bike event and and will be on hand to support throughout the event. Massimo also appreciates the good cuisine, especially the typical Tuscany dishes. So, if you are looking to try a particular Tuscan dish, wine or restaurant, Massimo is the man to ask!